I'm just a little bit late in participating in Emily's Kitchen edition of her Favorite Fives, especially considering her next edition is coming up tomorrow... I just thought that since I am often overwhelmed by my kitchen, it would be fun to focus on the favorites! 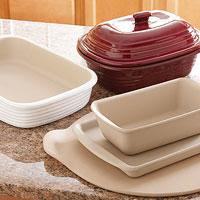 First on my list of favorites is my Pampered Chef Stoneware. I have almost all of the different stones, and love them all. In fact, the Rectangle Baker, Rectangle Stone, Large Bar Pan, Pizza Stone, and Muffin Pan could easily be listed as all five of my kitchen favorites, so I am grouping them all together. ;) The stoneware does an excellent job of evenly distributing the heat from my least favorite item lovely oven, and prevents me from burning everything. I'm sure there is probably a better one out there, but I just love my little Cocoa-Latte Maker. I use it nearly everyday to make Soy Chai Tea. Yum! I guess, my Vita-Mix would come next. (Mine is a 5000, which I splurged purchased years ago from Costco) Have you ever used one? 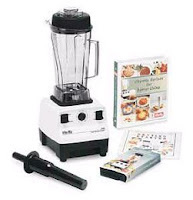 It's awesome for making smoothies, of course, but also makes great ice cream, soups, salsas, and even baby food. Not to mention, it is super easy to clean. A huge bonus since I already spend too much time washing dishes. I LUV anything Pampered Chef too. They are my favorites in the kitchen, always my go-to items. Great quality. You have me seraching teapots on line. I want the kind with the silvery scrolled warmer underneath, like at the tea houses. Congrats on being so close to being done with your 40 bags. Are you going to continue once you hit your goal? Jennifer ~ I just used my (Large) Bar Pan tonight for baking Orange Chicken. I also use it for Chicken Nuggets, Fish Sticks, Battered Cod, Taquitos, French Fries, Corn Dogs, and many other things. I don't use my small one quite as much, but still use it when I am reheating or making smaller quantities. I have the Halo Le Crueset tea kettle and really enjoy it ... it's in cobalt (my kitchen accent color). Great quality & just a bit bigger than the one you linked. My mom and I have made pizzelles. She purchased the Prego pizzelle baker two years ago for me. They are super easy to make and each batch makes a large quantity (important in large families!) There is even a recipe for chocolate pizzelles. I also love using my Pampered Chef products and own many of the same items you mentioned. Which stoneware pan is used more seems to change over the years ... right now it's the loaf pan. I've been on a fresh bread kick for at least a month & haven't purchased any loaves during that time. I've got to tell you, my PC covered baker has saved many a dinners! I use it to microwave meat on a regular basis, which is something I would never do, but when it take 15-20minutes to "bake" chicken or a pork loin, and it stays hot until I serve it (time mgmt at dinner time is not my forte! ), then it beats the oven, hands down! Not to mention, the meat tatstes wonderful! My MIL gave us the Keurig coffee maker for our anniversary last year (I think it was a $100 version) and we love it. You can get reusable filters, but I found the price of a box of little cups from Costco to be worth the conveniene. As an added bonus, the kids can make coffee for us, too! Must post again to say that the KEURIG is our favorite addition to our kitchen and our daily life of late. We recieved the $100 version 2 years ago and wake up with a giddy smile to personalize our coffee each morning...sometimes a decaf after dinner and the kids luv the hot chocolate. Check our coffeeicon.com for best prices, best variety and a facebook page that gives out weekly prizes. I was so surprised to recently will thermoses and mugs from them! On another note, I have luved reading how others use their pampered chef items. Great post, Jessica....as always! 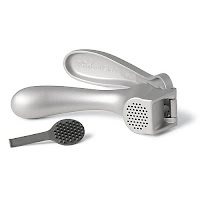 I must post, even this late, that the very first Pampered Chef item I bought was their can opener. (We are on a ridiculously tight budget, and I had never been to a PC party before but heard RAVES about their items... It was the only item I could afford!!) Anyway! I love it. My 'rookie' daughters (ages 8 & 9) love using it too. No sharp edges! Wonderful post! So interesting learning about what everyone else uses in their kitchens. I am glad to hear that the Pampered Chef Can opener works so well for you. I think, perhaps, that some of them might have been defective, mine included. In order for it to open a can, you must go around the can *at least* three times and even them sometimes it will only be partially open. I love my whistling kettle! It's especially great when both our mothers are getting hard of hearing, and then again, it just summons all to gather for tea time and a breaky chat. Love my pampered chef goodies here too, just some of the utensil items broke right away. Disappointed with a few things like that, but the rest is fabulous.